Albert Pike made his mark before the war in Arkansas as a lawyer and writer, but as a Confederate Brigadier General, he was, according to the Arkansas Democrat of July 31, 1978, a complete "WASH-OUT," not a hero. 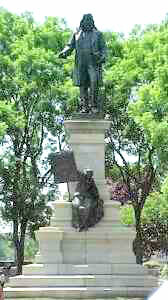 Yet, Gen. Albert Pike is the only Confederate general with a statue on federal property in Washington, DC. He was honoured, not as a commander or even as a lawyer, but as Southern regional leader of the Scottish Rite of Freemasonry. The statue stands on a pedestal near the foot of Capitol Hill, between the Department of Labor building and the Municipal Building, between 3rd and 4th Streets, on D Street, NW. More detail about the monument, including a photo and map, on the right. Further background on the colorful history of the statue can be found at the Masonic Info website. During the 1992 presidential campaign, Lyndon H. LaRouche and his vice presidential running mate, the Reverend James Bevel, launched a mobilization to remove the statue of General Albert Pike from Washington, D.C.’s Judiciary Square. On February 1, the campaign drew an angry attack from freemasonic leader C. Fred Kleinknecht, who attempted to defend both Pike and the Ku Klux Klan from LaRouche and Bevel’s attack. A speech given by LaRouche defending his actions can be found here (March 20, 1992). And a speech by Anton Chaitkin entitled ’Why Albert Pike’s Statue Must Fall’ can be found here (September 21, 1992). Adam Weishaupt (1748 - 1811) formed the Order of Perfectibilists on May 1, 1776 (to this day celebrated as May Day throughout many western countries), which later became known as the Illuminati, a secret society whose name means "Enlightened Ones". Although the Order was founded to provide an opportunity for the free exchange of ideas, Weishaupt’s background as a Jesuit seems to have influenced the actual character of the society, such that the express aim of this Order became to abolish Christianity, and overturn all civil government. 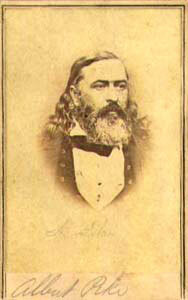 During his leadership, Mazzini enticed Albert Pike into the (now formally disbanded, but still operating) Illuminati. Pike was fascinated by the idea of a one world government, and when asked by Mazzini, readily agreed to write a ritual tome that guided the transition from average high-ranking mason into a top-ranking Illuminati mason (33rd degree). Since Mazzini also wanted Pike to head the Illuminati’s American chapter, he clearly felt Pike was worthy of such a task. Mazzini’s intention was that once a mason had made his way up the Freemason ladder and proven himself worthy, the highest ranking members would offer membership to the secret ’society within a society’.